Here’s another hands on report from a new tester in the Diablo 3 Beta. This one is by YrrAB, and he talks about his system and performance, general game impressions (which are almost all positive) and then goes into some detail about all five classes. I do not require your approval. Here’s an excerpt that covers a class he dislikes and one he loves, just to cover the extremes. The Monk. I can’t get into him. This is, obviously, completely personal opinion of course. His skills seem great, he seems responsive, his animations look good, but I just can’t take him seriously for some reason. Maybe he’s not meant to be taken seriously? I have hope that he’ll end up like the Druid or Assassin from D2:LoD for me – Didn’t bother playing them, until I saw someone else wreck everything with them. Then, I truly enjoyed playing those characters. Because of the fact that I just flat out don’t like the Monk, I’m not going to comment on him any further. This is only because I have nothing truly negative to say about him, other than he just doesn’t click with me. The Wizard is an amazingly fun class, and I’d be surprised if they made more changes to him. All of his attacks felt satisfying and powerful. Even the weaker ones were fun to use, and the only skills I didn’t really bother with were the armor skills. Disintegrate and Electrocute were my two main skills for the better part of the beta, at least once I hit level 8. Energy Twister is a fun skill, and while it can be somewhat random, it doesn’t have the same hit-or-miss style as Plague of Toads (WD) or Chakram (DH). Wave of Force and Frost Nova are two great skills when used hand in hand, as I’m sure many of you have seen. Magic Missile and Arcane Orb are your run of the mill point and shoot attacks, and they’re just as fun as the others. All beta testers are invited to write up their own experiences and opinions with the Diablo 3 beta; post them in the forums and we’ll try to get them quoted on the main page as well. Original forum version here. Click through for YrrAB’s full post. First off, computer specs. I posted them in the official D3 forums in a thread concerning the sluggish performance of D3. In store it was open box for 494$. Actually paid 20$ for this, looks to be cheaper now. 140$ out of the door, 120$ after rebate. It was tricky making this fit into the mid-tower, but I managed with little issues. So, total pricing was 660$ish for a machine that dominates D3 on all high settings at 1920×1080. Same goes for Skyrim, WoW, Batman:AC, etc. The first character I played through as was a Witch Doctor. I’m an oldschooler – sure, Arcane Power, Fury, etc. function the same way as Mana, but I like calling it what it is – Mana. I usually go for melee classes, but the Barb didn’t entice me too much and the Monk, well, I’ll get to him later. Within the first 10 minutes of the game, I was not hooked. I was very much enjoying my experience, but I KNEW that this being only a beta, it has a stopping point that isn’t far off from now. It took me about 45 minutes to complete the beta, and about 4 hours of play time total to get my character to level 13 and have mostly rares equipped. The monsters had a lot more personality, or something of the like, than anything from D1 or D2. I didn’t die once in my first playthrough, but the monsters weren’t as easy as I’ve read them to be. They put up decent fights, and there were enough random unique monsters and champions to keep me interested in searching for new baddies to kill. The atmosphere is pretty amazing. The ambiance and the music go very well together, and the subtle (or not so subtle) mist and fog that typically covers the outside area of the beta is very cool to see while actually playing. I will say that I very much dislike the text – it’s so basic that I’m not even sure it’ll be the final text in the game. But seeing gold and items drop with the text they have now, it just doesn’t feel very medieval. The sounds are impeccable, very reminiscent to the sounds from Diablo 1, particularly monster death sounds. I’ve yet to really notice if there are several different sounds that the monsters make on death, but the ones that they have in there (and the spacing between monster types) don’t really get old. The music was a pretty big concern for a lot of people, but so far I’m enjoying it. The New Tristram theme is pretty awesome, and there are plenty of throwbacks to the music of old. I believe I was in a place called Den of the Fallen, and the music was very tribal; Straight out of Kurast from D2. It was a relief to hear, and I’m excited to hear the rest of the soundtrack to the game. The quests are pretty amazing in this game. I’m not a big fan of the “Go here, talk to this, retrieve that…” structure, but it worked for me in this because it’s related to the lore, which I love. I’m pretty bummed that we haven’t had the opportunity to test the random adventure system, because I definitely see that as being a huge part of the game. The quests in general don’t drag out for too long, and I’m relieved that they stopped giving equipment in quest rewards. A part of me isn’t sure how I feel about receiving experience for quest completion, but the other part knows that Blizz doesn’t want us struggling to achieve higher levels, so it makes sense for them to cut out a good part of the grind. The item system, is, well, what I expected. At least in the beta, anyways. I miss inventory/ stash management, I miss identify and Town Portal scrolls, and I miss the attribute requirements on items. I’m sure a lot of you don’t miss any of the aforementioned, but I have no problems admitting that my longing for those things stems from the habits I had developed in D2. But, I’m a big boy, so I’ll get over it. The interface is good enough. Very easy to read, very clean, and matches the overall atmosphere of the game quite well. I’m not a fan of the default simplified tool tips, and I’m VERY bummed about the lack of a dedicated character stat screen (it’s now located in a little pane next to your equipment in your inventory screen). But I’m sure that’ll be something they re-implement, there’s not one reason I can think of not to. Time for the character break down. My skill critique in here is excluding the idea of runestones, so if there are any comments in regards to my personal opinions on skills, keep in mind that I’m fully aware rune stones will change EVERYTHING. Mostly for the better, too, I’m sure. The Barbarian plays exactly how you’d expect em’ to. Decent speed, plenty of power and great tanking ability. Some of the skills, like Battle Cry and Threatening Shout, I feel have very little use. You could say the same thing about the Barb in D2, and I’d agree. But I believe that’s why they brought the Barbarian back; To update him as they saw tons of potential. Other than two skills that I see no true value in, they did a great job, and I’m very excited to try him out at max level. A lot of his skill animations have great effects, and his skills feel very responsive, as opposed to the Demon Hunter. 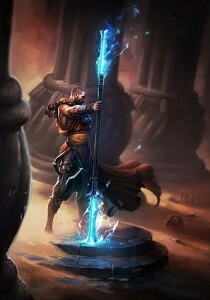 Cleave and Bash are GREAT generators, while Hammer of the Ancients and Rend were great spenders. Weapon Throw is another pretty fun skill, especially because it looks almost ridiculous. As most other reviews have stated, the Demon Hunter is pretty weak. I was lucky enough to craft a great bow for him to use at early levels, so I didn’t experience the weakness, but I could tell he was. His skills FEEL unresponsive, but they’re not. Just as bad though, in my opinion. The skills we get to experiment with didn’t really do much for me. Hungering Arrow was cool, but it’s the most basic skill out there, so I don’t wanna talk it up. Bola Shot and Entangling Shot weren’t very fun to use. Impale was powerful, but again, wasn’t very fun to use. Rapid Fire was pretty awesome, and the animation is pretty basic. Caltrops, I didn’t even bother with very often, and it wasn’t very fun when I tried it. Chakram was alright, when it connected. For a while, it was my main skill, and I had a pretty good idea of where to cast it so it’d hit most of my targets. In the end, I fell back onto Hungering Arrow and Rapid Fire, using Vault when I needed to. The Witch Doctor is definitely my favorite class so far. I have many gripes with him, but I love the skills and I love the play style with Mana. Poison Dart, much like the Wizard’s Magic Missile, is a great starting skill, and a skill that I used semi-regularly. It’s effective, quick, and the animation isn’t a distraction. Plague of Toads was a very fun skill to use, even with the randomness of the skill. It became clear relatively quickly that it’s a skill better off used when you’re toe to toe with any enemy. Corpse Spiders is one of the more annoying-but-incredible skills in the game. I fail to see WHY the Witch Doctor has to throw a Jar. The skill is relatively quick, but it’s another skill that has too much animation going on, in my opinion. But, as stated a few paragraphs ago, I’m well aware that rune stones will change the way all skills work, and I’m sure they’ll change most for the better. My favorite WD skill setup has been Grasp of the Dead (1), Spirit Walk (2), Firebomb (LMB), and Corpse Spiders (RMB). Great AoE damage and great survivability. This game is going to be incredible, but it IS pretty hard to determine that based off of the beta alone. Going into the beta, I wasn’t excited. I wasn’t excited because I wasn’t expecting much, I just wasn’t excited because I knew that this would only be 13 levels of the first third of one act of four acts of 4 difficulties. It’s extremely hard to hate and dismiss some of the features of the game when I can only apply them to 13 levels. Anything I have gripes with seem to stem from all the things I liked about D2 being absent. I can’t really hold that against Blizz, but all it takes is a few forum threads in the official forums for changes to be made, as seen with plenty of things before. Fun beta, great characters, items will be amazing, some skills are dumb without rune stones, and the music is sweet. The opinions are those of the poster, and not necessarily those of Diablo.IncGamers.com. Vote: How do you feel about the Skills and Runes system revision? I’m missing comments on runed skills. Instead you talk about runestones that will change skills. I suppose you did your walkthrough before Patch 13.
loved the review. good to hear that someone with a level head can enjoy the demo despite all the changes that are being made.